Background Risperidone (RSP) has a rapid onset in vivo, low dosage and high plasma protein binding rate, therefore therapeutic drug monitoring (TDM) is needed to ensure safety in clinical treatment. However, compared with blood, hair is non-invasive, safe, non-infectious and easy to transport and store. Aims This study aims to investigate the correlations among the drug concentrations of RSP in hair and serum, which provides an experimental basis to explore hair as a novel biomaterial to meet the needs of clinical detection. Methods 34 patients with schizophrenia treated with RSP for more than 3 months were enrolled in this study. About 1 cm section of hair near the scalp was taken from the subjects, pretreated and detected by liquid chromatography-mass spectrometry. A correlation analysis was conducted among the drug concentrations in hair, the serum concentrations and the daily dosage. The data were analysed using SPSS 20.0 software. Results There was significant correlation between the hair concentration of RSP (two-tailed test, r=0.440, p=0.009) with the serum concentration of RSP, and the hair concentration of 9-hydroxyrisperidone (9-HR) with the serum concentration of 9-HR had no significant correlation (two-tailed test, r=−0.217, p=0.217); the total concentration of the RSP and 9-HR had no significant correlation between hair and serum (r=0.227, p=0.196). 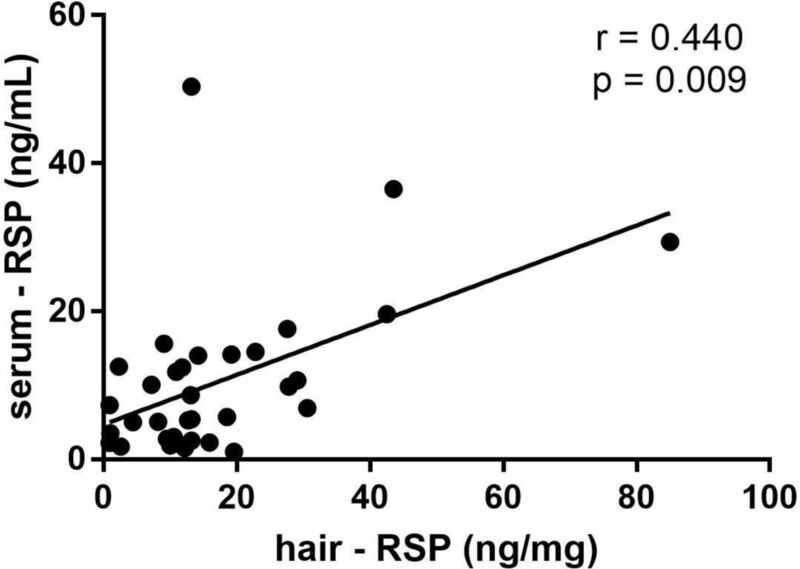 The dosage had no statistically significant correlation with the concentration of RSP in hair (r=0.207, p=0.241), 9-HR in hair (r=−0.194, p=0.271) and the total concentration of RSP and 9-HR in hair (r=0.188, p=0.288). There was no statistical correlation between the dosage and the concentration of RSP in serum (r=−0.059, p=0.741), but significant correlation between the dosage and 9-HR in serum (r=0.581 p<0.001) was found, and the correlation between the dosage and the total concentration of the two drugs RSP and 9-HR in serum was also significant (r=0.437, p=0.01). Conclusion The correlation analysis showed that the concentration of RSP in hair was statistically significant with the serum RSP concentration. In this study, we provided some experimental basis for hair as a new biomaterial to monitor the therapeutic drug concentration. Risperidone (RSP), a second-generation antipsychotic that antagonises the D2/5-HT2A receptor, has a good therapeutic effect on both positive and negative symptoms of schizophrenia, showing fewer adverse reactions (eg, inhibition of motor function). Thus, RSP has been widely used in clinical practice.1 RSP is metabolised in vivo by 2D6, cytochrome P450 enzyme or transporter,2 or undergoes a binding reaction via two-phase metabolism. The main metabolite of RSP, 9-hydroxyrisperidone (9 hour), also has strong pharmacological activity. The therapeutic range of 20–60 ng/mL (approximately 50–140 nmol/L) for the active moiety (RSP +9-HR) is often cited.3 Although the pharmacological effect is exerted by the unbound fraction of the drug, it is customary to measure the total (bound+unbound) concentration according to the previous studies. The total blood concentration of RSP and its metabolites are related to curative effect of the drug.4 Due to the narrow therapeutic window of these drugs, most antipsychotics usually cause unpleasant side effects and severe poisoning after overdose. Suicide and suicide attempts are also frequent in populations using antipsychotics5 and several intoxications have been published.6 7 Therefore, therapeutic drug monitoring (TDM) of risperidone was used to guide treatment usually. Considering that patients tend to take several drugs simultaneously during the treatment, about 2–3 or even more blood samples (5 mL) are collected for detection in clinical practice. Consequently, finding new non-invasive alternative biomaterials to replace blood has widespread application value. As an appendage of skin, hair is composed of keratinised epidermal cells. Drugs enter hair through blood circulation. Hair is easier to store than blood and is not easily affected by the ambient temperature, serving as a good biological sample. Moreover, hair is safe, stable and non-infectious without restrictions of time and place, which could avoid physical discomfort, dizziness and infection caused by blood drawing.8 Hair analysis can also offer the possibility of revealing an individual’s history of drug exposure for periods varying from weeks to months, depending on the length of the hair shaft.9 Segmental hair has been used to detect the concentrations of RSP and 9-HR in a study previously.10 There were only three cases in the study, and the correlation between the concentration of RSP in hair and in blood was also not further studied. In our preliminary work, a liquid chromatography-mass spectrometry (LC-MS/MS) method was established to detect the concentration of RSP and 9-HR in hair.11 Moreover, it was found that the concentration of RSP in hair at the 2 cm segment near the scalp was well correlated with the dosage. At present, however, the correlation between the concentrations of RSP and 9-HR in hair and their blood concentrations remains unclear. We conducted a preliminary study to investigate the correlation between the concentration of RSP in the hair of hospitalised patients and the historical blood concentration, providing an experimental basis for the new testing method and biological samples. The flowchart can be referred in figure 1. 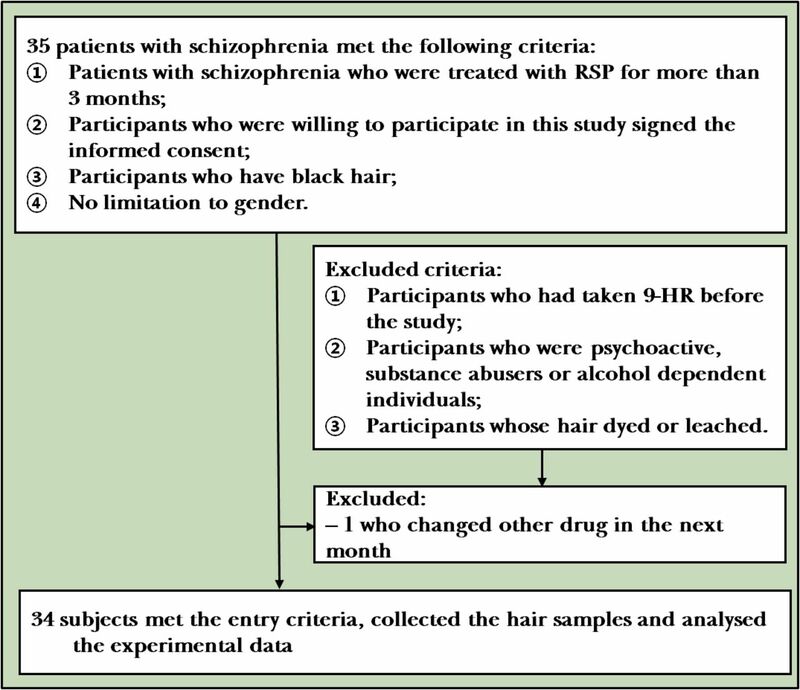 The participants met the following inclusion criteria: (1) patients with schizophrenia who were treated with RSP for more than 3 months; (2) participants who were willing to participate in this study provided written informed consent before enrolment; (3) participants who have black hair; (4) not limited to gender. The participants were excluded according to the following exclusion criteria: (1) participants who had taken 9-HR before the study; (2) participants who were psychoactive substance abusers or alcohol dependent individuals; (3) participants whose hair was permed, dyed or bleached. The exit criteria were as follows: (1) participants who did not agree to continue or participate in the study (withdrawal of informed consent); (2) participants who were not considered to meet the requirements of the study (the administration time was uncertain or with no history of blood concentration data); (3) participants who were lost to follow-up. The hair was collected at 07:00 a.m., and the steady-state minimum concentration about 12 hours after the last administration was regarded as the history of blood concentration. By reviewing their medical history, we recorded the history of blood concentration data in the corresponding month, dosage and combined medication of patients with schizophrenia who took fixed-dose RSP for more than 3 month. Total 35 patients who met the enrolment criteria were included. One patient was excluded due to the use of other drugs during the third month. Thus, 34 patients were actually included into the study. The enrolled patients were screened according to the inclusion criteria and an area of 1 cm2 of hair (about the thickness of a small finger thickness) near the scalp area of occipital region was taken. The root position of hair was marked. The samples were enclosed in envelopes, numbered and stored in a dry environment at room temperature. Pretreatments of hair included washing, grinding, dissolving, extracting and purifying were performed. The hair samples of each patient were numbered, washed with distilled water, acetone and distilled water again and dried in the air. The hair near the root segment was cut into 1 cm pieces and grinded. About 20 mg hair was accurately weighed and transferred into a 10 mL centrifuge tube with a lid. The internal standard working solutions, including deuterated risperidone (RSP-d4, 1.0 µg/mL) and deuterated 9-hydroxyrisperidone (9-HR-d4, 0.01 µg/mL) solutions, were prepared. Then, 100 µL RSP-d4, 50 µL 9-HR-d4 and 1 mL sodium hydroxide solution (1N) were added to the centrifuge tube. After a supersonic treatment for 2 hours, the mixed solution was neutralised by an equal volume of hydrochloric acid (1 N), 200 µL of 1 N sodium hydroxide was added to adjust the pH value. To the mixed solution, 5.0 mL methyl tert-butyl ether was added. Then, the solution was mixed by vortex-mixing for 1 min, and the supernatant was transferred to a new tube and evaporated to dryness under a stream of nitrogen at 40°C water bath. The residue was redissolved in 100 µL mobile phase, and 5 µL supernatant was injected into LC-MS/MS. Chromatographic conditions: Chromatographic separation was achieved on an Agilent Zorbax SB C18 column (2.1×50 mm, 1.8 µm) at 30°C using isocratic elution with mobile phase. The mobile phase consisted of water (pH 4.0 was adjusted by formic acid) containing ammonium acetate (0.01 mol/L) and acetonitrile (70:30 v/v). The flow rate was set at 0.3 mL/min. A 5 µL sample solution was injected into the LC-MS/MS system for analysis. The mass spectrometer was performed on electrospray ionisation source (ESI+) by multiple reaction monitoring (MRM) mode. Nitrogen was used as nebulising and secondary gas at a pressure of 35.0 psi. The drying gas was set at a flow rate of 10.0 L/min and the temperature was set at 350°C. The following parameters were employed: capillary voltage (+) 4.0 kV, Delta EMV (+) 300 V. The MRM acquisition parameters were as follows: m/z 411.2 → 191.0 for RSP, m/z 427.2 → 207.1 for 9-HR, m/z 415.2→195.2 for RSP-d4 and m/z 431.2 → 211.1 for 9-HR-d4. 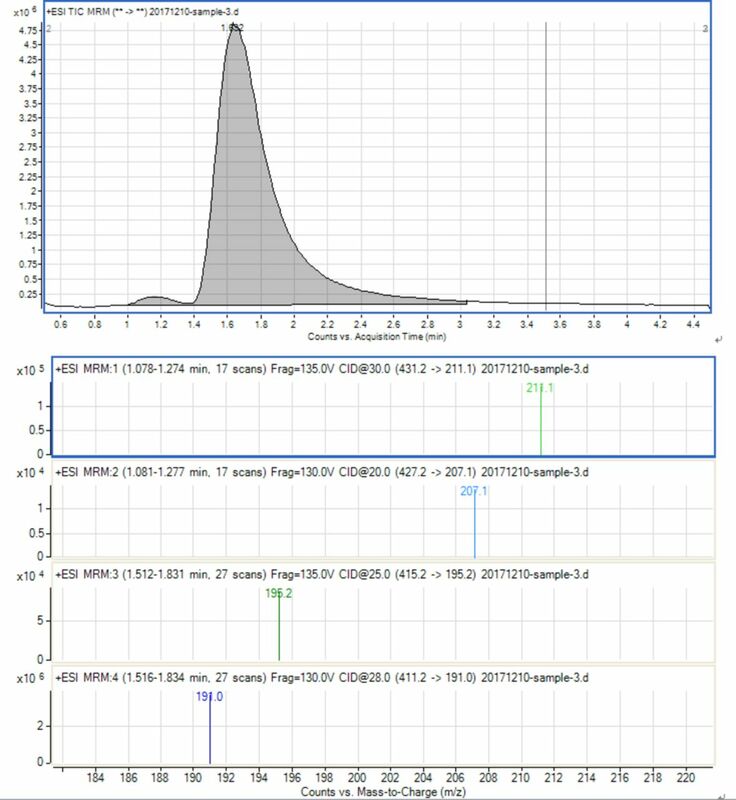 The detail of method validation has been described previously by our group,11 and for the LC-MS/MS TIC and MRM ion chromatograms in No. 3 sample of the standard and internal standard substances, see figure 2. SPSS V.20 software was used for the analysis. For the correlations among the dosage, the concentration of RSP, 9-HR, the sum of the RSP and 9-HR in hair and the concentration of RSP, 9-HR, the sum of the RSP and 9-HR in serum of the corresponding month, respectively, Spearman’s correlation was used. The demographic data, daily dosage of the subjects, the concentrations of RSP and 9-HR in hair, and the serum concentrations of the corresponding month are shown in table 1. A total of 34 subjects were enrolled in our study. The correlations between dosage and the concentration of RSP, 9-HR or the sum of two drugs in the hair and the respective serum concentration were analysed. As shown in table 2, this work showed statistically significant correlations between the concentration of RSP in hair and the serum RSP concentration (two-tailed test, r=0.440, p=0.009), see figure 3; the concentration of 9-HR showed no statistically significant correlations between hair and serum samples (two-tailed test, r=−0.217, p=0.217); and the total concentration of the two drugs RSP and 9-HR had no significant correlations between hair and serum samples (two-tailed test, r=0.227, p=0.196). The dosage showed no statistically significant correlations between the concentration of RSP in hair (two-tailed test, r=0.207, p=0.241) and 9-HR in hair (two-tailed test, r=−0.194, p=0.271), and the total concentration of the two drugs RSP and 9 -HR in hair (two-tailed test, r=0.188, p=0.288). There were no statistically significant correlations between the dosage and the concentration of RSP (r=−0.059, p=0.741), but it showed significant correlations between the dosage and the concentration of 9-HR in hair (two-tailed test, r=0.581, p<0.001) and the dose showed significant difference with the total concentration of the two drugs (RSP and 9-HR) in serum (r=0.437, p=0.010). Hair samples have been widely used in medicolegal analysis. Antipsychotics are being used from several milligrams to hundreds of milligrams daily. After a specific period of accumulation time, the content of the drug in hair is higher and the quantity of the original drug and its metabolites can be tested simultaneously. Shen12 and Doherty13 introduced the method of simultaneous detection of antipsychotics and their metabolites by gas chromatography-mass spectrometry (GC/MS) and LC/MS/MS, respectively. Compared with the traditional GC-MS, LC/MS/MS method can be screening analysis of antipsychotic drugs in hair, and it can be adopted to the MRM mode which effectively reduces the influence of hair matrix and greatly improves the sensitivity. It can detect up to pictogram/milligram level targets in the hair, especially highly polar and instable drugs and their metabolites.14 15 The ESI-MS2 fragment pathway of RSP and its metabolites 9-HR is shown in figure 4. Therefore, LCMS/MS method was used to detect the RSP and 9-HR concentration of all the 34 hair samples. Hair is a non-invasive and favourable biological marker for monitoring the long-term systemic exposures to medications. Moreover, hair grows at a rate of approximately 1 cm per month and drug analysis in hair may allow for the identification of metabolic activity throughout the period of medication taken medicine. In contrast, blood can only provide information regarding drug concentrations at the time of sampling. Therefore, it is important to analyse the correlation between the total concentration of the two drugs in hair and in blood. However, there is no domestic study on the correlations between the concentration of RSP, 9-HR or the total of the two in hair and the corresponding concentration in blood, which we have first studied to explore whether the hair could be used as a substitute biomaterial for blood. Some studies have reported the total blood concentration of risperidone and its metabolite is associated with curative effects of the drug.2 22 In this study, we found that the concentration of RSP in hair was significantly correlated with the RSP serum concentration (r=0.440, p<0.01), and the concentration of 9-HR in hair had no correlation with the serum 9-HRconcentration (r=−0.217, p>0.01), which may be affected by the small hair value. Consequently, the total concentration of the two drugs in hair was correlated with their concentration in blood.23–25 We found that the total concentrations of the two drugs in hair were not related to the two drugs in blood, that may be related to the small 9 -HR value, which might be relevant to the fact that the metabolite 9-HR had difficulty in entering hair or be related to RSP producing 9-HRin blood by metabolism. In this work, the dosage was not correlated with the blood concentration of RSP (r=−0.059, p=0.741), but correlated with 9-HR (r=0.581, p=0.000) and the two drugs (r=0.437, p=0.010). These findings were contradictory with Wei 200526 and Zhao 201227 who found that the plasma concentrations of 9-HR or the sum of RSP and 9-HRwere more related to the daily dose than RSP. The dosage had no statistically significant correlation with the concentration of RSP in hair (r=0.207, p=0.241), 9-HR in hair (r=−0.194, p=0.271) and the total concentration of RSP and 9-HR in hair (r=0.188, p=0.288). This may be due to the small sample size or due to the difficulty in obtaining hair samples of adequate length in male patients. It is also possible that the accumulation and metabolic mechanism in the hair is different from the mechanism in the blood. However, further research is needed. This study has the typical limitations of naturalistic studies, which are not designed to identify variables with small effect sizes; more controlled clinical designs are needed to identify variables with small effects. Among the subjects enrolled in this study, most of the male inpatients had a haircut once a month. The lengths of their hair samples that were collected at one time were short, which could not be divided into more segments for the measurements. Hence, the correlation between the concentrations of the other segments or the total segments and the historical blood concentration remains to be further studied. Since the quantity of the samples in this study was not enough, there might be a statistical deviation. Accordingly, further expansion of the quantity of the samples is needed in future studies. In addition, based on ethical considerations, this study only retrospectively analysed the historical blood concentrations of the patients and determined the drug concentrations in their hair. The medications and time points have not been strictly unified. In the following studies, some prospective studies are needed, relevant data should be recorded, and hair or blood samples should be collected at different times after medication for pharmacokinetic research of drugs, but these still need further plans. With regard to taking the medicine time and blood collection time, it is best to collect blood and hair samples at different times after taking the medicine, and to fit the pharmacokinetic study in the hair,28 but this still needs further planning. Next, we may also conduct correlational studies on other psychiatric drugs between hair concentrations and blood concentrations, or even correlation studies on psychiatric drugs in combination with other drugs. In the future, we will continue to expand the types of psychiatric drugs determined by hair and continuously optimise the detection methods. TDM refers to determining the concentrations of drugs in a biological matrix via modern analytical techniques under the guidance of pharmacokinetic principles, which is used for the guidance and evaluation of medication.29 Antipsychotics or antidepressants have a narrow therapeutic window and strong side effects and become potential pathogenic6 and lethal factors.30 Consequently, TDM is needed in clinical applications of antipsychotics and antidepressants as an important monitoring parameter.31 While the collections of blood samples are invasive, they require professional operations. Blood samples should be stored and transported under special conditions, have biosafety hazards and are troublesome in waste recovery and disposal. Furthermore, plasma protein binding rate is significantly affected by individual differences.32 33 As non-invasive biological specimen, hair is easy to transport and store, is not affected by external factors and is safe, hygienic and non-infectious.34 Therefore, hair can be used as a substitute for blood, showing epoch-making significance. As a TDM sample, hair has the following advantages: the prodrugs and their metabolites in hair are stable;35 the hair samples can be repeatedly collected; the detection window of hair can be detected for several months or even years;36 hair can be used for the information tracking of drug cessation, missing dose and drug abuse;37 the results provide the basis for diagnosis, treatment, detection of drug efficacy and patient compliance.38 As a supplement to blood and urine samples, hair shows great significance in clinical practice. Hair analysis has been applied since the 1950s, which only was used for qualitative detection of drug exposure due to the limited testing methods at the time,21 With the development of microdetection technology in recent years, the appearance of LC-MS/MS and GC-MS has improved the detection sensitivity, making the detection of drug concentration in hair into a quantitative level. In practical applications, the drug concentration in hair can be used to verify patient compliance.39 It was found that the cortisol concentration in human hair was correlated with its blood concentration, suggesting that hair could be used as a biomaterial in vivo. However, there is no study on the correlation between the concentration of RSP in hair and its blood concentration in China. This study first found that the concentration of RSP in hair had a certain correlation with its blood concentration, which served as an experimental basis for whether hair could replace blood as auxiliary diagnosis biomaterial and provided referenced value for clinical research.
. The relationships between plasma concentration of risperidone and clinical effects. Shanghai Archives of Psychiatry 1999;11:189–92.
. 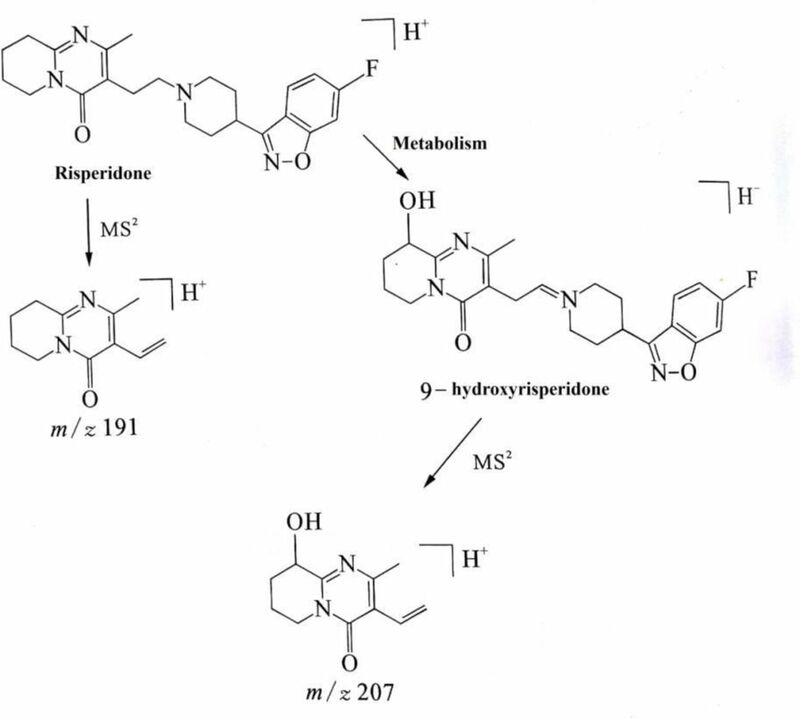 Determination of risperidone and its metabolite of 9-hydroxyrisperidone in hair by LC-MS/MS. Progress in Modern Biomedicine 2015;15:2221–4.
. The evaluation and determination of antidepressant and antipsychotics of drug in hairs [J]. Journal of Forensic Medicine 2000;03:148–52.
. Influential factors of serum concentration/dosage ratio for schizophrenia patients after oral administration of risperidone. Chin J Clin Pharm 2018;34:117–9.
. The relationship between dose of risperidone and the steady plasma concentrations of risperidone and 9-HYdroxyrisperidone in schizophrenic patients. Chin J Hosp Pharm 2005;25:607–8.
. The concntration of risperdone an 9-HYdroxyrisperidone in schizophrenic patients. Chin J Mod Drug App 2012;6.
. Determination of clozapine, norclozapine, and clozapine-N-oxide in serum by liquid chromatography. Clin Chem 1993;39:1656–9.
. Fundamentals and applications of hair analysis. Beijing: science press, 2010: 1–13.
. Clinical and application in forensic medicine research of hair analysis. China Foreign Medical Treatment 2010;29:178–9. Xiujia SUN obtained a master’s degree from Qiqihar University in China in 2008. She had worked in Pharmaceutical Analysis sector of Wuxi New Drug Research and Development Ltd as a researcher from 2008 to 2011. Currently, she is working as a research assistant in the biochemical laboratory of Shanghai Mental Health Center. Her research interest includes clinical detection of serum concentration. XS and LW contributed equally. Contributors XS drafted the manuscript. LW and FZY were responsible for patient recruitment and samplings. PJ and HML provided literature and guidance for methods. JJR and XS were responsible for the determination of samples. HL provided the guidance on ethics approval. CL designed and guided this study. CZ funded the study and was responsible for the implementation of the study. The authors are responsible for the data of the paper. Funding This work was supported by the National Natural Science Foundation of China (No. 81471358), Shanghai Health and Family Planning Commission Youth Fund Project (No. 20144Y0080), Shanghai Health and Family Planning Commission Youth Fund Project (No. 20154Y0045) and Shanghai Health and Family Planning Commission Fund Project (No. 201740089), Shanghai Natural Science Foundation(15ZR1435300); Shanghai JiaoTong University School of Medicine Natural Science and Technology Foundation(14XJ10080), the Shanghai Municipal Education Commission—Gaofeng Clinical Medicine Grant Support (No. 20152530).